UPDATE 3-SEP-2018: My apologies, my account and my cousins do NOT have the latest updates. Since they are more recent and prettier than the last time I looked, I had made that false assumption. 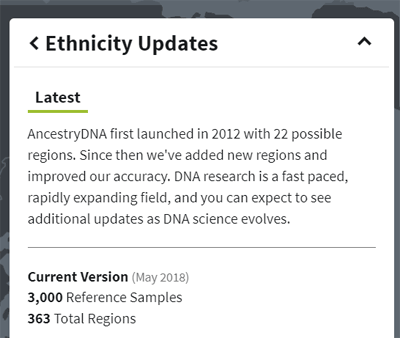 Thanks to the members of the Ancestry DNA Matching Facebook group for showing me what the real update looks like. To see what your version is click on the “up to date” or the “i” in a circle on top of your ethnicity results. Then it will show you a box that tells you what version you have. If you only have 3000 reference samples, then, like me, you do not have the very latest. 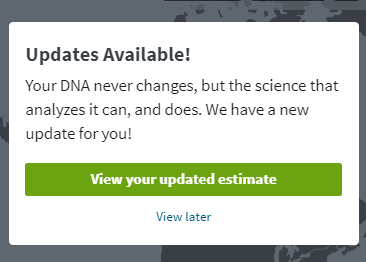 Over the summer Ancestry DNA has been rolling out their new ethnicity estimates and they have finally arrived in my account. My brother’s ethnicity has not changed, it just has more features. The predictions for my brother, as shown above, have not changed (click here for my previous article on his ethnicity). 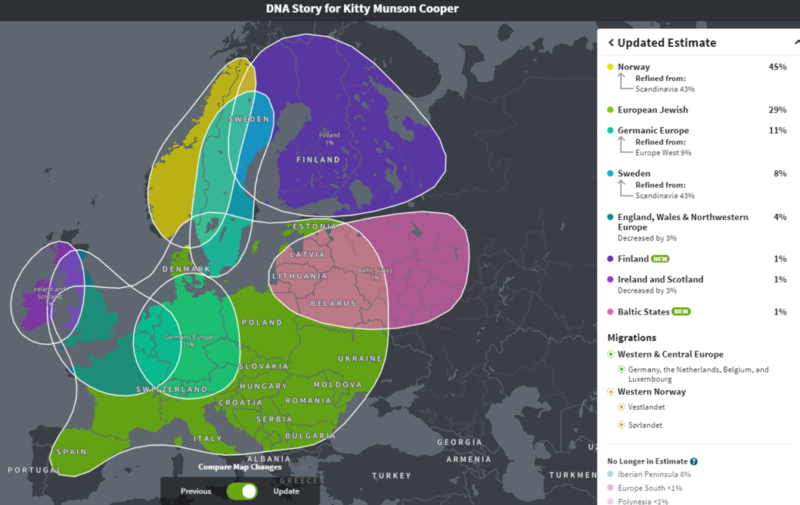 He is still 62% Scandinavian (our Dad is Norwegian American) and 22% Jewish (Mom’s dad was German Jewish). 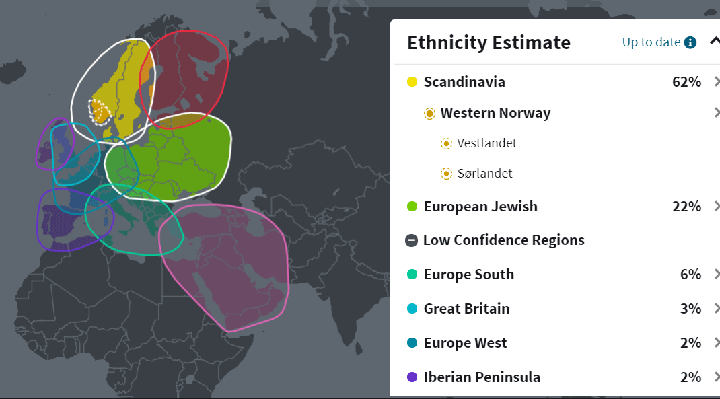 While the Bavarian from Mom’s mother is still showing as Scandinavian, Europe South (this was Italy/Greece), and West European. The English comes from Dad according to various other sites where he was tested. This is discussed in my article Norwegian or English? where I suggest that it is the English who have some Norwegian. The new presentation is prettier and it has some very accurate subcategories. Yes all our Norwegian ancestors are from the circled areas, Western and Southern Norway. One thing I find very enjoyable are the descriptions of the subgroups and migration groups. Also of interest is the story they tell you when you click on one of your groups and a date like 1875 as above. 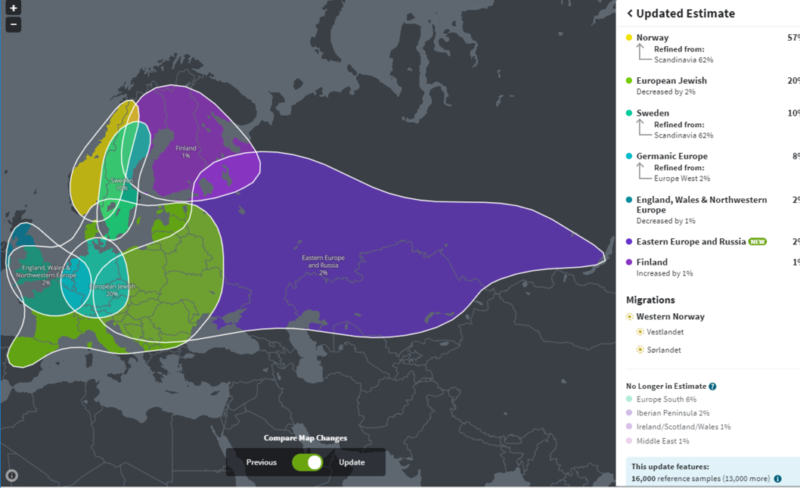 My ancestry is different from my brother’s but not wildly so. 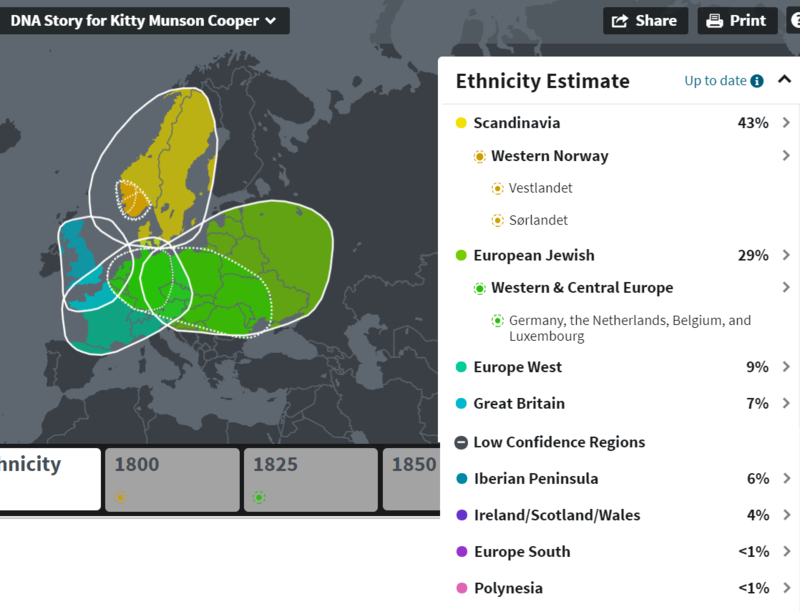 I have more Jewish (German Jewish so within the predicted subgroup), less Scandinavian, and a few interesting bits of noise like Polynesian. I remember one ethnicity estimate somewhere which claimed I had 1% Amerind. I like to think there is a sprinkling of Sami that creates that blip. I have examples from a wide variety of people thanks to the many adoptees and relatives that I have helped. By the way, my perfect cousin (who I often blog about) is still 100% Scandinavian with the expected subpopulations of South and East Norway. 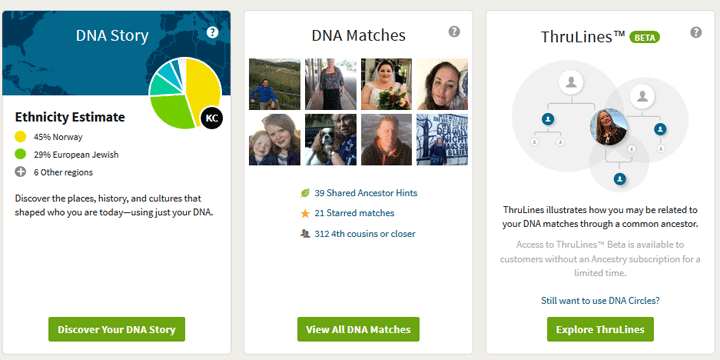 Ancestry.com ‘s genetic communities are a good way to understand your family’s journey for the last few hundred years. Unlike the ancestry composition percentages, these communities are more recent and include a write up of the history of each group starting in 1700. 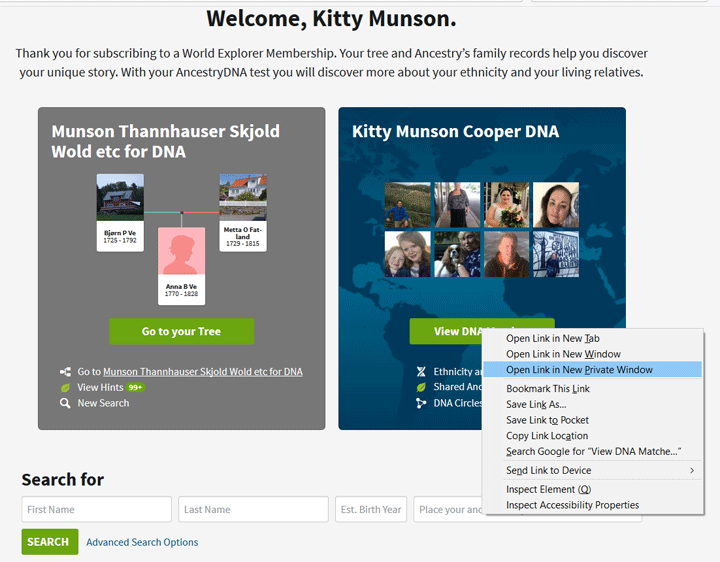 Since I frequently work with adoptees, I am really hoping this helps with that analysis. I am finding that people with deep American roots have far more communities than those of us with recent immigrant ancestors. The adoptee I am currently working with has six communities! Shown above. He knows his mother’s father and that is the Deep South community. I suspect that the New Jersey and. 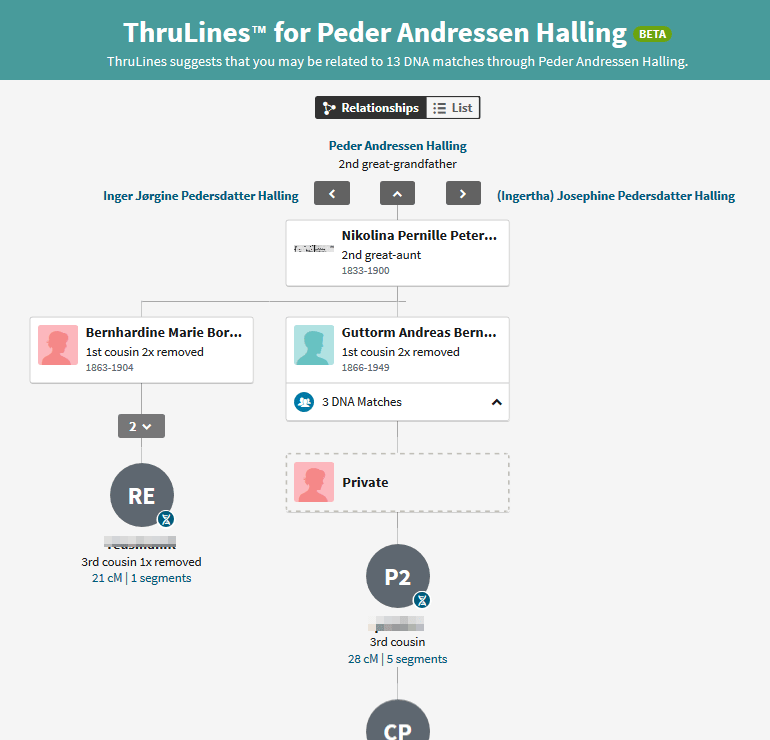 Pennsylvania groups are from his Dad, based on other matches at Family Tree DNA. I will report back if this new feature helps for his case. The reason this may be helpful with adoptees is the ability to separate matches into the different communities. 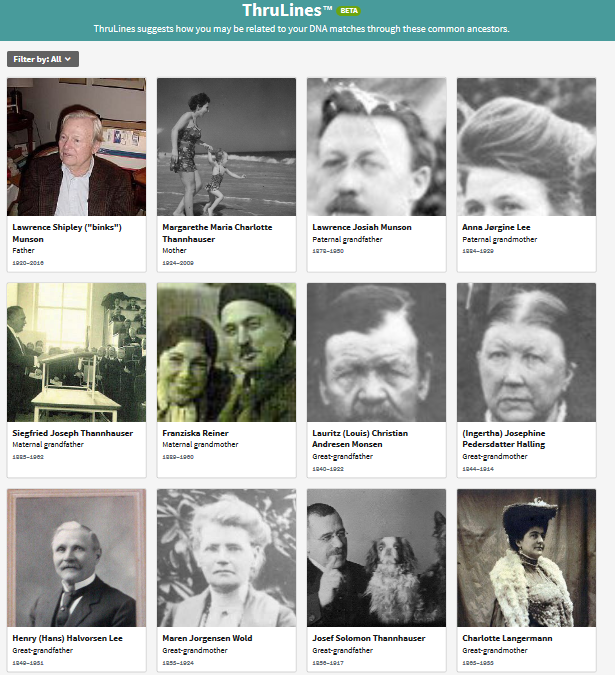 Clicking on a specific community name gets you to a page with a map for that group and its history stories. There is an icon called Connection at the top left of the page (my red arrow in the image example to the left). Clicking it takes you to a page with information about your connections.